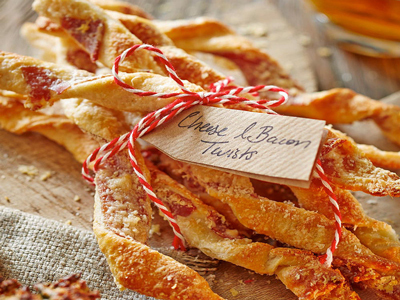 These cheese and ham straws will make the perfect nibbles for an alfresco summer gathering. Preheat the oven to 180°C/Gas 4 and line 2 baking sheets with non-stick liner. Combine the flour and salt in a mixing bowl then rub in the butter and lard until the mixture resembles coarse breadcrumbs. Mix in 50g of the Parmesan. Using a knife, stir in enough water to form a stiff dough. Wrap in clingfilm and chill for at least 15 minutes. On a floured surface, roll out the pastry into a rectangle the thickness of a £1 coin. Brush with the beaten egg and sprinkle over 75g of the Parmesan. Lay the Parma ham over the cheese. Cut the pastry into 1cm strips along the length of the rectangle using sharp kitchen scissors. Place the strips onto the prepared baking sheets, twisting each 5 or 6 times first if desired. Sprinkle the remaining Parmesan over the strips and bake for 15-20 minutes or until crisp and golden. Tip: Save time by using ready-rolled shortcrust pastry. Simply unroll the pastry and continue from step 3 of the recipe, adding 125g Parmesan instead of 75g.